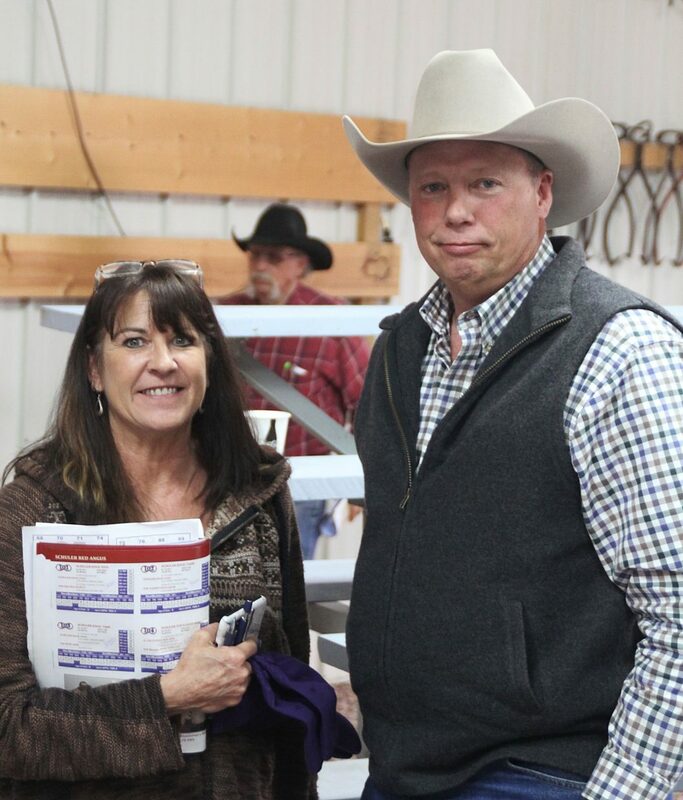 Greg Comestock with Kerry Paddock, Patterson Ranch, Gillette, Wyoming. Katie Ocshner, Lou Leland, Frank Wedel and Mel Leland at the 36th Annual Schuler Red Angus Production Sale. Ranchers enjoyed a beautiful day to appraise the offering at the Schuler Red Angus 36th Annual Bull Sale, March 22nd at the ranch near Bridgeport, Nebraska. The large crowd was joined by active online bidding to make a successful event for this Annual Bull Sale. 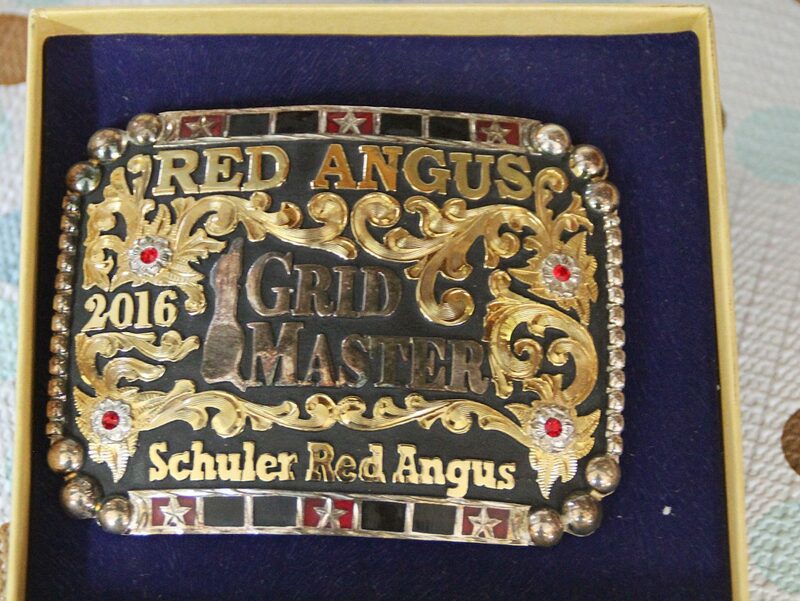 The Schuler program is built upon the reproductive and maternal traits required to "Get the Cow Right First," but their genetics have earned numerous Red Angus "GridMaster" awards for the product traits of both the Schulers' and their customers' finished cattle. 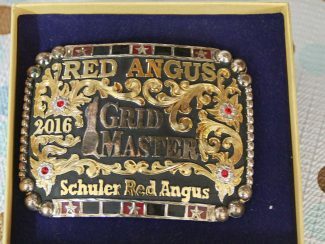 Schuler Red Angus' leadership in carcass data collection is well into its third decade; with approximately 20 percent of Red Angus' high accuracy carcass sires proven through Schulers' progeny testing program. Annually, the Schuler program tests young sires for both carcass and feed efficiency data to ensure the bulls they offer produce offspring demanded by downstream beef industry customers. A large crowd of ranchers from Nebraska and surrounding states competed for both Red Angus and Schuler Red Composites, giving the Schuler family a great sale. The high selling bull was lot 5, Schuler Bonafide E538. This son of Schuler Confidence C810 was out of a 2-year-old daughter of Schuler Envoy 2115Z and brought $16,500 for one half interest and full possession, going to Leland Red Angus of Sidney, Montana. Bonafide packaged powerful phenotype with a 118 ADG ratio and 124 IMF ratio. Schuler Bourne 111C-7177E, Lot 18, was the 2nd high selling bulling. He sold to Select Sires of Plains City, OH at $13,500 for one half interest and full possession. Lot 4, Schuler Headliner E548, a 2/17 son of Schuler Confidence, registration #3779021 sold to George Lee, Nebraska. The Schuler Red Composite program is now in its third decade of providing ranchers with a user-friendly solution to profit utilizing heterosis and breed complementarity without increasing mature size. Buyers were able to select between uniform sire groups that varied from one-half to seven-eighths Red Angus genetics. The high selling Schuler Red Composite bull was lot 124, Schuler Red 62 18 Karat-E937, going to long time Schuler customer Bryan Wilson of Alliance, Nebraska. Repeat customers of the Schuler program, Kenansville Cattle Company, Florida and Cullan Farms, Nebraska, returned to make volume selections from the 36th annual offering.